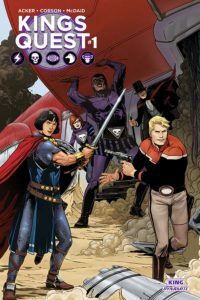 Pullbox Reviews: King’s Quest #1- All the Pulp you could ask for! On sale May the 4th (be with you…)! Flash Gordon! Mandrake the Magician! Prince Valiant! The Phantom! The….. other Phantom? In a market chock full of dark and broody anti-heroes, no holds barred vigilantes, and sparkly vampires (ugh), Dynamite is bringing Old School adventure back. The pulp heroes of the old newspaper comic serials are the great grandfathers of characters like Superman, Batman, Captain America, and Iron Man. To forget all about them and allow them to fade into the background as dusty relics would be a waste, so it’s with enthusiastic relief that I picked out King’s Quest for review. Ming the Merciless tried to conquer Earth, which shouldn’t come as much of a shock to anyone. That’s kinda what he does. Thankfully he was soundly trounced and sent a-packing by the unlikeliest of unlikely teamups, courtesy of Dynamite Entertainment and King Features Syndicate. The heroes of yesteryear banded together to do what they do, and for Prince Valiant in particular, they looked damn good doing it. If you missed it, check out the events of “King’s Watch” for the whole throwdown. Now, they have to come to the rescue of one of their own. In the conflict, Dale Arden was taken prisoner by the Evil (pronounced Eee-vyl) Ming, and this band of champions are once again called on to save the day. To do so, they’ll use the sword of Prince Valiant, imbued with the magic of Merlin, to cross space and confront Ming on his own turf. But there’s a hiccup… Two years have passed since they took up the call to rescue Flash’s best gal Dale. In that time, who knows what kind of treatment she’s had at the hands of Ming the Merciless, so the pressure is on for this King’s Quest to come to the rescue! Okay, that might all sound a little corny, but what can I say? Prince Valiant is in the book! How can I not sound like a cheeseball radio show announcer? All kidding aside, this first issue for the next chapter in this epic team up was a blast. The banter was quippy. The action was fast paced and swashbuckley. Everyone had a role to play and a time to shine, and they did it nicely. There are a few changes to the roster, however. It looks like there’s a new Phantom joining the ranks of those who have held the title “the Ghost that walks”, and she’s a little shaky on the whole heroing thing. She’s accompanied on her quest to save Dale and become the hero she’s destined to be by Lothar, formerly the companion of Mandrake the Magician, and currently wearing the costume of the old Phantom. Another addition to the roster of heroes in King’s Quest is none other than Jungle Jim, the hard drinking, harder fighting lord of all things wild. Lest we mistake him for the “Lord of the Apes” (who is not a member of the King Features roster), Jungle Jim is able to communicate with the denizens of the wild, and to animate and control plants. Granted, this is a pretty hefty step away from his original comic strip incarnation, in which he was just an ordinary, non-powered big game hunter, but Jungle Jim’s appearance here was a highlight of the issue for me. Overall, my well-documented love of all things (well, most things) pulp aside, King’s Quest hit all of the right beats for me. The writing is sharp and full of wit, with the characters each finding their “voice” early on. The running narrative from Jen “Phantom Junior” Harris was entertaining, establishing her as a rookie adventurer unsure of her abilities or her place among the other heroes. Jen is the POV character, and her occasional fangirl lapses as she witnesses firsthand the feats of the champions she finds herself fighting alongside are a great foil for the story’s intergalactic scope. This is swashbuckling adventure, rolling along at breakneck speed, done very well for today’s comic book reader. Where else would you ever see Flash Gordon fighting alongside the likes of the sword wielding Prince Valiant? It’s the combo you probably never even knew you wanted, but now that it’s out there how can you not be interested?